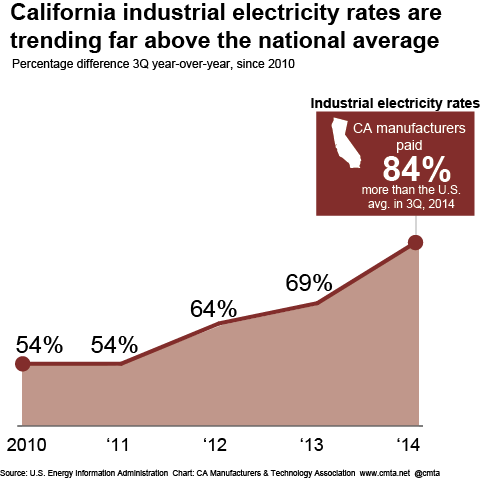 California manufacturers depend on cost-competitive electricity rates to stay in business and grow their operations. 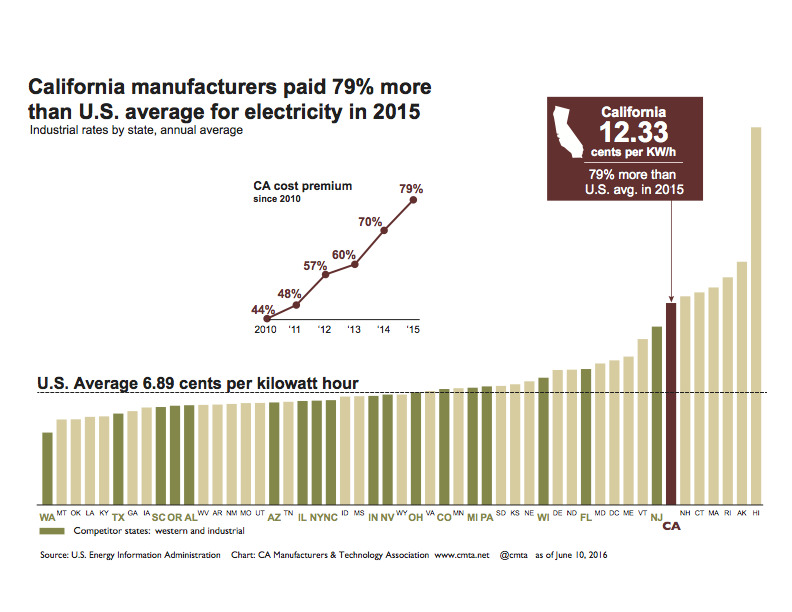 Since 2010 California's energy policies have steadily driven up industry's premium to purchase electricity in the state. The annual average in 2010 for the "industrial" rate was 44 percent higher than the national average, growing to a whopping 79 percent higher in 2015. The "commercial" rate that smaller manufacturers tend to pay has also steadily increased. That rate was 49 percent higher than the national average in 2015. Coupled with data that shows California has attracted no more than two percent of U.S. manufacturing investments since 2010, this information tells us that we must make sure our energy policies take into account their impacts on high-wage manufacturing growth. 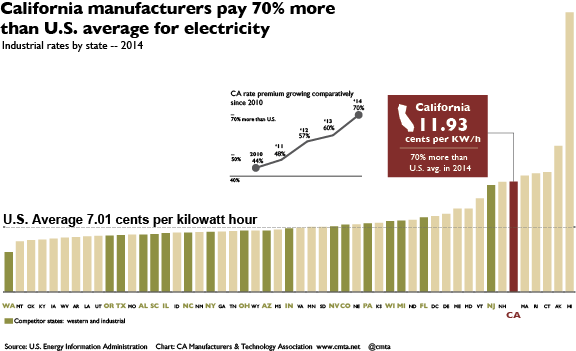 California's manufacturers paid 70 percent higher electricity rates than the U.S. average in 2014. What's worse is that our rates have seen a steady incline for the past five years starting at 44 percent higher premium than the U.S. average in 2010. California has reached a new high in 2014. For the first time we are consistently paying 80 percent more than the national average in industrial electricity rates. We looked at the most recent third quarter data for 2014 and compared it to each of the third quarters back to 2010. The trend is moving in the wrong direction. Up from 59 percent in 2010, we now pay 84 percent more than the national average. The chart below shows the trend, and a Californians for Affordable and Reliable Energy report -- written up this week by CMTA's Michael Shaw -- lays out an ever important path toward a comprehensive state energy plan for cost effective post-2020 climate change goals. Affordable and reliable energy is essential to California's economy and the prosperity of our workers. Manufacturers are leading the way in investing in energy efficiency and new energy sources to help us meet future energy demands. 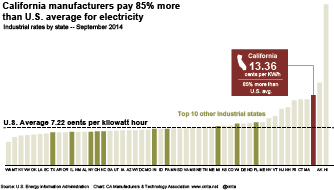 California manufacturers already pay 50 percent higher industrial electricity rates over the rest of the country. Because of a wide range of new energy policies, those rates are increasing for not just us but the rest of the different rate classes from top to bottom. Even our poorest will pay in both higher energy costs, as well as fewer job opportunities. It's not too late to fix this. It's not just electricity costs of course. All of our energy needs will be more expensive over the coming months and years. The total bill is unknown. The true environmental benefits are not exact. California can do this though. We simply need thorough analysis so we know which policies provide the biggest benefit for the least cost. This will allow us to prioritize and implement a statewide energy policy that grows our economy, meets our energy goals, and drives our environmental leadership throughout the country. This is why the Californians for Affordable and Reliable Energy coalition took the time this week to pen the following excellent blog response to the Environmental Defense Fund (EDF) reaction to a preliminary CARE and Navigant Consulting cost assessment study. We agree with CARE and EDF! California needs more analysis to ensure our energy cost effectiveness. Yesterday, the Environmental Defense Fund (EDF) released a critique of Navigant Consulting’s whitepaper, “Preliminary Assessment of Regulatory Cost Drivers in California’s Energy Market.” The CARE Coalition (Californians for Affordable and Reliable Energy) agrees with EDF’s assessment that the Legislature and state agencies must carefully examine the benefits and costs of our state’s energy programs. But CARE would assert there is a void of information regarding the extent of state program impacts, and we believe that additional information is crucial in order for California legislators and regulators to adequately consider implementation of current programs and adoption of any new energy related mandates. The CARE Coalition is focused on educating Californians about the energy challenges ahead as they relate to protecting an affordable and reliable supply of fuels and electricity. The California Department of Finance recently reported that unemployment increased for the second month in a row to a level of 8.9%, widening the gap with the U.S. unemployment rate of 7.3%. At the same time that unemployment is increasing around the state, communities are being informed about increases in energy costs. The CARE Coalition believes that a full investigation of the state’s energy programs is necessary to understand the relationship between job creation and economic growth and rising energy costs. Another aspect of energy policy that deserves careful examination is to assess the cumulative impact of the broad range of regulatory programs currently being implemented. The groundbreaking nature of many of these programs provides a compelling reason to not only assess the impact of a particular program, but more importantly, determine the impact of all the programs collectively to California consumers and economy. The Navigant whitepaper encouraged more analysis and an understanding of existing state policies. We highly recommend that the Legislature and state agencies offer more clarity on the obligations of California ratepayers and taxpayers as existing programs are implemented in the coming months and years. CARE believes that there will be significant impacts on California energy users that cannot be avoided without a coherent strategy that organizes and prioritizes energy actions ahead. “Californians are informed about the state's march towards being an environmental trailblazer. Unfortunately, they are uninformed about the associated costs that will be triggered across our economy. Navigant Consulting’s whitepaper brought to light significant questions about cost impacts and potential unintended consequences. We encourage the state to do a more comprehensive evaluation in order to design a comprehensive energy policy that is consistent with the Governor’s desire to encourage business investment and create jobs” said Rob Lapsley, President, California Business Roundtable. As a part of our mission to educate, CARE contracted with Navigant Consulting to provide information regarding cost and reliability impacts on consumers as a result of energy policies and mandates. Navigant and its legacy companies have worked on energy market issues for over 30 years, and in all aspects of the utility planning, operations, and legislative and regulatory compliance, providing Navigant with a comprehensive understanding of the interplay of key market issues and drivers that impact the energy industry. Navigant’s whitepaper relies primarily on previous public reports, studies and statements by California and Federal regulatory bodies for its references including: the California Energy Commission, the California Public Utilities Commission, the California Air Resources Board, the California Independent System Operator, and the Energy Information Administration among others. Navigant’s whitepaper warns policymakers and stakeholders that “The cumulative effect on energy costs (electricity and transportation fuels) is only beginning to be understood by those most affected, which speaks to the need for a more informed dialogue.”CARE believes this dialogue is worth having if we truly care about protecting business investment and job creation in the state. Energy costs and certainty are a major factor for businesses of all sizes that should not be underestimated in the state’s energy planning process. The Navigant whitepaper clearly articulates that it is examining the costs and is not a cost/benefit evaluation of recently passed policies and regulations. It makes clear that the purpose was not to examine already well-documented environmental and related benefits that have been outlined in other studies. Instead the whitepaper calls for a more detailed and comprehensive review of the cumulative impacts of a much larger list of policies and regulations than just the three examples examined in the whitepaper. As cost increases are appearing in communities across the state for both fuel and electricity bills, consumers and business groups are asking questions about this trend and wondering what they are facing down the road. We hope the state takes these questions seriously and begins a process to evaluate energy policy impacts and provide more informative analysis regarding what businesses and consumers should expect as a result of California’s energy programs.